In Britain, from the reign of Queen Elizabeth I and certainly once the 17th century was in full swing, Oriental porcelain was the 'stuff' of Royalty and the nobility, which is no real surprise when one views the alternatives. Amongst the lower echelons there were fingers, wood or even leather for plates and drinking vessels. Amongst those of middling rank, perhaps pewter or delft and other pottery and those of higher birth had glass, precious metals and maybe porcelain. Until the very earliest years of the 18th century, porcelain could only come from the Orient, but its 'discovery' in 1708 and rudimentary birth in Meissen eventually let the cat out of the bag as far as domestic European production of the hallowed substance was concerned. Partially due to a ruthless guarding of the secret and partially due to Britain's geographic distance from Germany, it was sometime before porcelain was manufactured on these shores. As ever, the roots are shrouded in mystery and actual detail seems immersed in a heady mix of alchemy, counter patents, short lived business deals and the headiness of being a market leader in a rising market. 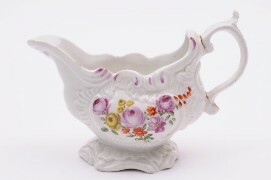 A Bow porcelain sauceboat in the Desirable Residence pattern. The premier British manufactories where probably the competing London concerns of Bow and Chelsea; Chelsea Porcelain first appeared sometime around 1743-45. Its earliest production seemed to be copies of decorative silver crayfish salts and small animal figures, not surprising as it was founded by the silversmith Nicholas Spirmont. However, it was nearer 1750 before porcelain production occurred in meaningful volume. Bow Porcelain, for which Thomas Frye and Edward Heylyn first lodged patents as early as 1745, can only really be proved to be going by 1749; with a good number of dated documentary 'Made at New Canton' inkwells being dated 1750. However, relatively recent archaeological discoveries of a porcelain manufactory at the Limehouse site in London add another valid contender for the crown of premier porcelain producer in Britain, with suggested dates of 1745-48. 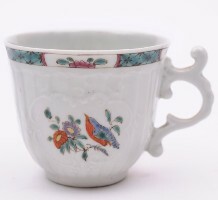 A Worcester porcelain coffee cup, circa 1755. Outside the question of who was the first to produce porcelain, there can be no doubt who was the greatest producer of domestic porcelain, both in volume and longevity. The accolade must go to Worcester Porcelain, first formed in 1751 on the banks of the Severn by Dr Wall. Following closely on his heels though was Derby Porcelain, formed in the later 1750s, but still surviving today. However, a broad and often overlooked manufactory is that of Lowestoft Porcelain, formed sometime in the mid 1750s and, despite its relatively rural setting, managed to survive just into the 19th century. Although latter day cynics like the comfort of 'marked' porcelain, Britain has had a broad and sometimes experimental history of porcelain production that provides plenty of volume, variation, craftsmanship, beauty and, above all, academic interest that can suit all pockets from the modest to the most generous. Local to the Westcountry are the short-lived concerns of Cookworthy's hard paste experiments at Plymouth, latterly taken up by Champion in Bristol and eventually fizzling out with New Hall. 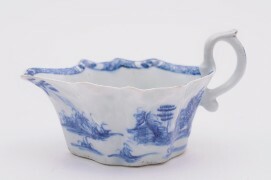 A Plymouth (Cookworthy) porcelain sauceboat, circa 1758. There is the significant volume from Caughley, multiple concerns in Liverpool and niche factories such as Vauxhall, Isleworth, Longton Hall, West Pans to name but a few and perhaps the holy grail of domestic porcelains has to be either Limehouse or the 'A' class porcelains.